Ship of Heroes - A Successor to City of Heroes? 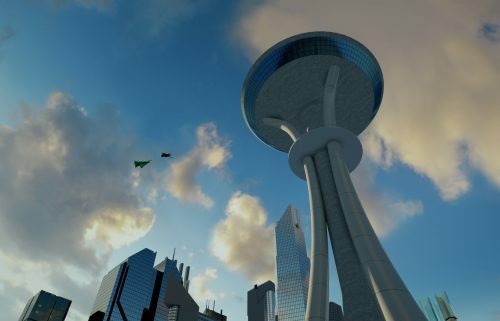 There are a few superhero MMO's in development right now following the sad demise of City of Heroes. One that recently came to my attention is Ship of Heroes. It has been in development for some time with a team of ex-CoH players putting their own money into the project. The game takes place inside a huge ship. Yes, you read that right...a ship! There are cities within the ship, the image is part of Apotheosis City, just one of the many in the ship. But it seems that someone left the ports open when it docked and dangerous alien life forms secured a foothold on the ship. There are also attacks from other alien life forms from outside, it seems that human expansion across the universe isn't always welcome - who'd have thought it! Which, of course, is where our superheroes come in. The material used to power the ship has had a strange effect on some of the humans on board, resulting in them gaining super powers. Such 'heroes' can fly from the start, take on roles in defence of the ship and the human life it carries in both PvE and PvP. In addition to saving the day, heroes can also join the ship's crew or even hide from the authorities on the ship if they have a darker side. As the ship travels through space, it will dock periodically at new worlds, other ships, space stations, etc., giving access to new missions, material, monsters and suchlike. Here's a quote directly from the website: Ship of Heroes is going to balance ease of play with complexity and diversity of content. A number of videos have been released giving us a taste of what's to come. One of which is the character creator. It's an impressive looking tool. Here's the video, definately worth a look. Each part of an outfit can be given individual colours and patterns and it's planned to have customisable colours for powers as well. The game follows in the footsteps of the original City of Heroes archetypes, launching with Tanker, Scrapper, Defender and Blaster. Promised for the near future are Controllers and Commanders with the possibility of some others being added to the game later. Unfortunately, the Kickstarter for Ship of Heroes has been cancelled. Development of the game, however continues unabated with donations being taken onsite.